Reduces the Breakdown of Muscle Tissue During Intense Workouts. Instaclear 3-Phase Solubility Treatment: High-dosage BCAA technology with the highest-grade, freeze-dried BCAAs and with an unmatched taste makes Aminocore an Easy-To-Mix drink that you can take to every workout. New science has revealed that mTor-p70S6k is the trigger directly responsible for extreme muscle growth. Branched Chain Amino Acids (BCAAs) were identified to activate increased mTor-p70S6K cellular signaling responsible for profound muscle gain. Activation of the muscle cell growth signals increased by 350% (3.5 times greater)‡ with 8,180 mg (8.18 g) of 45% Leucine, 30% Valine and 25% Isoleucine, pharmaceutical-grade BCAAs. The mechanism behind Aminocore's ability to prevent catabolic muscle loss has been discovered. Molecules called MAFbx increase dramatically during training. They lock on to muscle cells and act like a shredder, literally destroying muscle tissue. Aminocore to the rescue. The gene chip analysis showed a dramatic decline in the number of MAFbx with 8.18 g BCAAs. This is the number one reason that many people who hit the gym cannot gain or hang on to significant muscle size. Caloric restriction, limiting carbs and increased cardio intensity; all essential for effective dieting, and all rapid ways to breakdown and flush away muscle. Muscle breakdown takes place when you're dieting. Less muscle reduces your metabolism and as a result, your ability to burn calories. Aminocore feeds your muscles while dieting and dramatically limits muscle loss. The net effect; you retain muscle, melt fat and maintain a higher metabolism. Aminocore the dieting secret you've been looking for. ‡ Combined with intense resistance training, research has shown that 8,180 mg of BCAA in a 45:30:25 ratio increase signaling within muscle cells to upregulate protein synthesis (growth) by 350%. Research conducted at the Nobel Prize winning Karolinska Institute in Stockholm, Sweden. Journal reference: Karlsson et. al. Am J Physiol Endocrinol Metab 287:E1-E7, 2004. 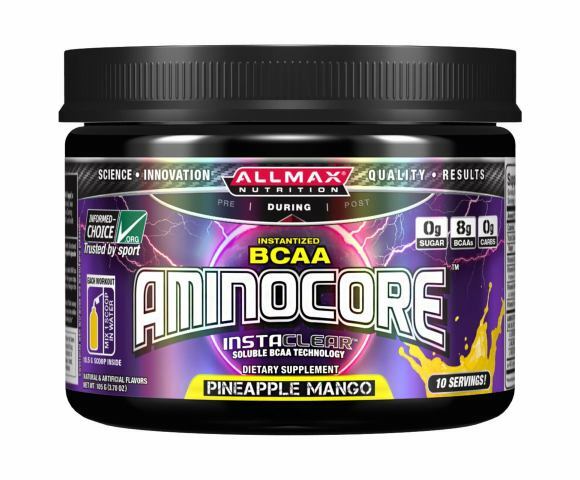 To activate protein synthesis and increase muscle recovery, take 1 scoop of Aminocore during weight training or any athletic event. On non-training days, Aminocore can be taken anytime on an empty stomach. Using a shaker, tall glass or water bottle, mix 1 scoop of Aminocore into 500 ml (17 oz) of cold water. Take during workouts. Лимонная кислота, натуральные и искусственные ароматизаторы, яблочная кислота, сукралоза, ацесульфам калия, натуральный цвет [куркума (куркума длинная, корневища), бета-каротин, свекла красная (бета обыкновенная, корневая)], лецитин (подсолнечник). Предупреждение о аллергенах: Производится на объекте, который также обрабатывает продукты из молока, сои, яиц, арахиса, дерева, рыбы, ракообразных и моллюсков. Do not take if you have pre-existing medical conditions. Consult a healthcare practitioner prior to use if you are pregnant or breastfeeding. Those sensitive to Vitamin B3 (niacin) may experience flushing of the skin that is generally mild and transient. Discontinue use and contact your healthcare practitioner if you experience adverse reaction. Consult a healthcare practitioner prior to use if you have liver or kidney disease, or if you have been instructed to follow a low protein diet. Keep out of reach of children and pets. Store in a cool, dry place away from direct sunlight. Do not purchase if seal is broken. ♦ Из-за естественных изменений плотности продукта, обусловленных осаждением и / или влажностью, значения являются приблизительными. Продукты продаются по весу.